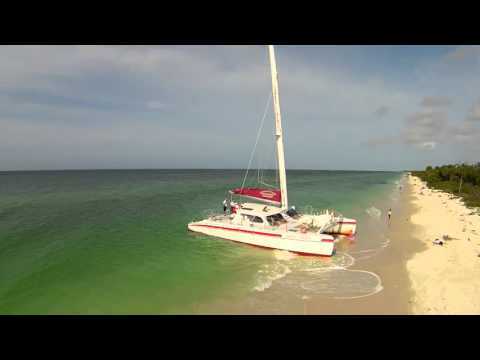 Award-winning 53-ft. sailing catamaran that accomodates up to 44 people. Offering 3 daily cruises including shelling beach excursions on a Keewaydin Island, nature and sightseeing tours showcasing large mansions on Naples Bay and dolphin watching. Also offering our famous SUNSET CRUISES daily. Passengers are welcome to BYOB wine/beer are welcome in small coolers. Cruising the pristine local waters on one of our daily Naples cruises aboard our award winning 44 passenger 53′ Sailing Catamaran is the perfect way to spend your day. We have a variety of cruises to choose from such as shelling, sunset or sightseeing tours. We are also a unique venue for private occasions such as intimate weddings, large social groups, corporate events and memorial services for burials at sea. Local residents, visitors and our seasonal northern friends have enjoyed the Sweet Liberty trips for over 25 years in Naples. Award winning 53-ft. sailing catamaran offering shelling beach excursions and tours past the large homes on Naples Bay, dolphin watching and nature tours, and our famous nightly sunset cruise. Let us assist you in planning the perfect small wedding, either onboard or on a remote island beach.